The Planning Notepad by John Krissilas: When Beauty Meets... Fast Food?! When Beauty Meets... Fast Food?! Shopper's Drug Mart is confounding me. They've spent a lot of time (and A LOT of money) over the last few years seemingly building a strong association with beauty and cosmetics. Walk into any SDM these days and you'll no doubt be forced to trudge through the cosmetics section before you can get to the store proper. (For most women, of course, this part of the store is the best part, which I guess, after all, is the whole point...) They've invested a lot in improving this section of the store, and making it a major part of the SDM brand promise. 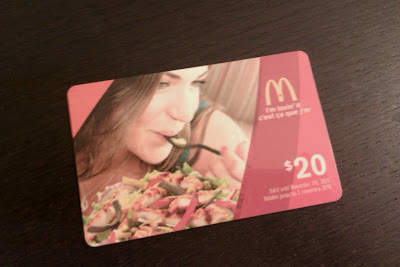 Let's just say I've been enjoying every dollar from my $20 McDonald's charge card. So, there you have it. I get a nice bonus for spending money at SDM, McDonald's gets a fair bit of traffic from me (and now I'm hooked on their coffee). I guess it's a fair trade off. But I wonder what it does to the Shopper's Drug Mart Brand???? ?